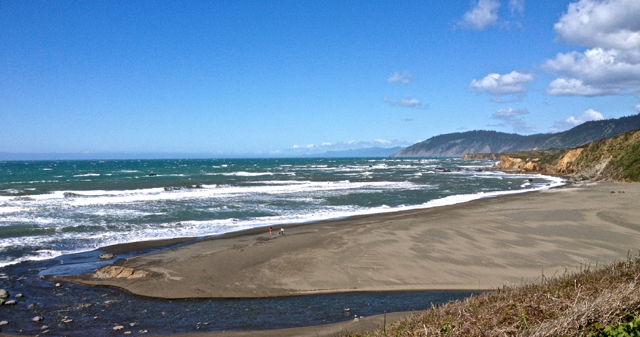 I live in the park on the headlands above Westport Beach in my Winnebago motorhome. Walking down the hill to work at the beach store, this is the view that greets me. I wonder…..will I ever tire of it? Such a beautiful view. I know I would never tire of looking at that view. What a great view first thing in the morning. Love the water and beach. You are living the charmed life! As are you, my dear friend. You have it all and enjoy it every day! I feel very fortunate indeed. A minister friends once told me that this life on earth is the only real hell. Well, you’ve managed to turn yours into quite a little heaven. Congratulations! No, I doubt that you’ll ever tire of it. We live our dreams; the only way to live and love this life. Thank you, Alice. What a neighborhood . . . . sigh! One of the many reasons I am staying here for a while.